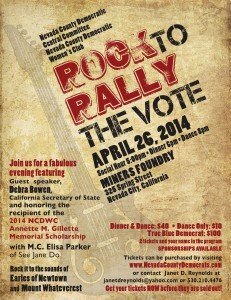 The Nevada County Democratic Central Committee and the Nevada County Democratic Women’s Club present Rock To Rally The Vote, on Saturday, April 26, 2014 at the Miners Foundry. Social hour begins at 5:00 p.m. with Dinner and 6:00 p.m. and Dancing at 8:00 p.m. The evening will feature guest speaker Debra Bowen, CA Secretary of State and will honor the recipient of the 2014 NCDWC Annette M. Gillette Memorial Scholarship. Elisa Parker of See Jane Do will emcee. After dinner the dancing begins as guests rock to the sounds of Earles of Newtown and Mount Whateverest. Tickets for the Dinner & Dance are $40.00 while the Dance only is $10.00. True Blue Democrat tickets are $100.00 and include 2 tickets and your name in the program. Tickets are available online or by calling (530) 210-4476.